eCigs HQ: January SmokeTip Flavor of the Month! Home » e-Cigarette Special Offers » January SmokeTip Flavor of the Month! Offer good thru January 2013 and subject to availability. In an effort to give their customers an opportunity to try a variety of different flavors, SmokeTip is continuing their Flavor of the Month Program. At the beginning of each month, SmokeTip is offering a new and unique flavor not regularly available on their website. They try to have enough stock to last for the month, but there are no guarantees — make sure to buy early if the flavor interests you. To start the New Year on a delicious note, the SmokeTip Flavor of the Month for January is Blueberry! Fresh and sweet, SmokeTip Blueberry Cartomizers are fruity and refreshing. Blueberry is currently available in a limited supply in all strengths so order now while supplies last! 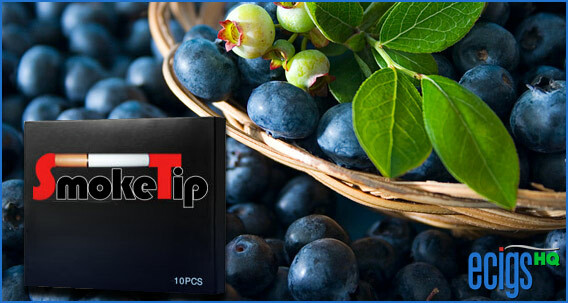 To take advantage of the Flavor of the Month today, visit the SmokeTip website by clicking the banner above or the link below to order Blueberry today. Reviewed by Admin in e-Cigarette Special Offers | Comments Off on January SmokeTip Flavor of the Month!